Bitcoin has become pseudo religious for most, especially for the “old” timers. As with any subculture, there are different deities that we all worship. The empirical facts that you choose to disbelieve or challenge point to which Bitcoin religious sect you belong. 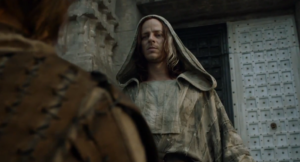 The heretics are made to repent on the high altar of Reddit and Bitcointalk. That’s much better than ending up in dungeon of the High Septon, or burnt alive by the Red Woman. This week the discussion will focus on the Goddess of Markets, Janet. Don’t let Janet’s appearance fool you, she’s got the global financial system in the palm of her hands. Some traders and investors (long holders who are down double digits), constantly pray for Janet to deliver Wall St. financial institutions to Bitcoin. “When Wall St. finally gets involved…” the price will be at some absurd nominal level the faithful cry. They pray to be rescued from fomo buying at the all time high. This past week traders convinced themselves that Janet would deliver a watered down Bitlicense, and the launch of the newest fully US compliant spot exchange Gemini. 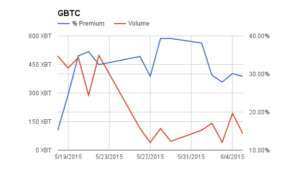 Bitlicense came and went, and the price briefly rallied a few dollars. There were no game changing announcements of a legacy financial institution finally actively trading Bitcoin. 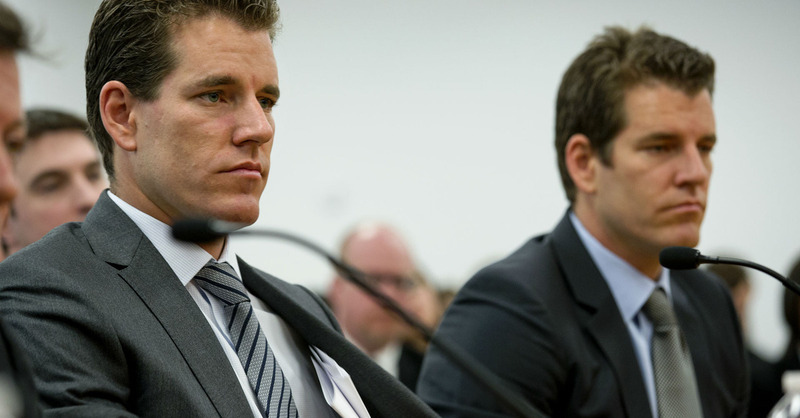 The Winklevoss twins sent a tweet with a rocket ship, and traders again prayed to Janet that Gemini was a herald for the holy grail of an US listed ETF. Janet was too busy awaiting Non Farm Payrolls to really care. I made a pilgrimage to Jekyll Island to pray to Janet and she told me, the Wall St. banks desire the sacrifice of retail traders before they will go all in. They want to trade against retail “dumb” money, not a cohort of their banking peers. The exchange that can offer a plentiful supply of dumb money trading or investing in Bitcoin is the exchange where Janet will send the Wall St banks first. The location is irrelevant and so are the regulations. Ask any Wall St. trader, and they will hark back to visions of the old days. The old days before the current ineffectual myriad of global securities regulations existed. The old days when you could operate a chat room called “The Cartel” and compliance looked the other way while you blatantly rigged the global FX market. They certainly don’t profess their love for Glass-Steagall or Dodd-Frank. A currency cannot be considered well functioning until there is a liquid local debt market. Bitcoin currently lacks credible companies and or governments issuing Bitcoin denominated debt. To price a proper yield curve, it is necessary to produce a zero curve. A zero curve uses the yields of zero coupon bonds at different maturities. A straight bond such as an US Treasury Bill, Note, or Bond (the demarcation depends on the maturity), is a combination of zero coupon bonds each with a principal and maturity equal to each coupon and or principle payment. E.g. A 1 year Treasury Bill that has semi-annual coupons, is a combination of two zero coupon bonds. Using bond math one can bootstrap the zero curve and begin to price fixed income securities in a particular currency. 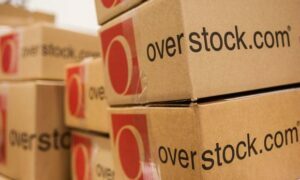 Overstock announced that they will issue a $25 million private bond using the blockchain. The bonds will be traded a regulated exchange called Pro Securities (Overstock recently bought shares in the exchange). This is a very important first step in the evolution towards a liquid Bitcoin and other crypto currency debt market. Issuing Bitcoin debt is a very attractive proposition for a company. Holders of Bitcoin grasp at any opportunity to invest their coin in reputable operations, and will accept lower yields given the chance to invest. Currently investment grade corporates can issue debt at very attractive rates because of central bank largesse, but that won’t always be the case. For Bitcoin companies that do not have fiat currency earnings, it would be advantageous to issue Bitcoin bonds. If Overstock can create an exchange where reputable Bitcoin and non Bitcoin companies offer debt securities, this will jump start the movement. From a derivatives standpoint, having a pool of investable debt securities and a zero curve allows the creation of many new types of products. Bond futures, interest rate swaps, swaptions, credit default swaps, and many other products will now be possible. The global debt market is the most important and the most liquid. 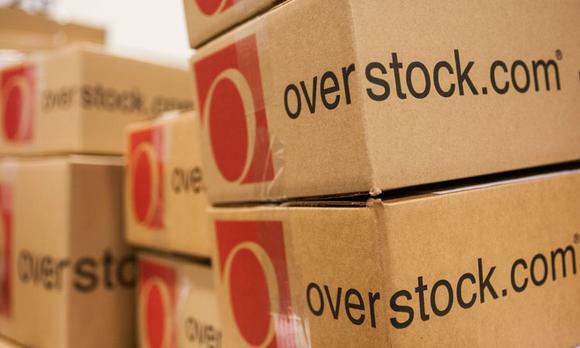 We as a community should do what we can to support Overstock’s efforts, it will benefit us all. 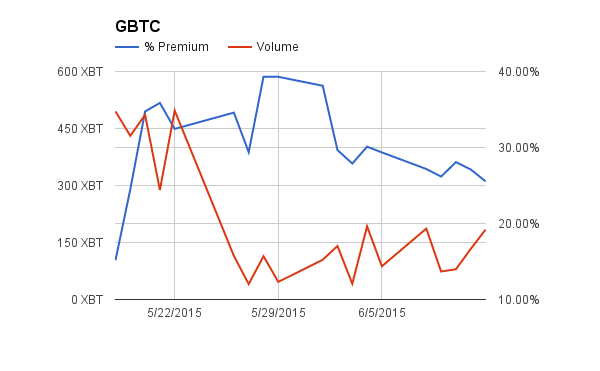 GBTC’s average volume for the week was 113 XBT up 44% WoW. 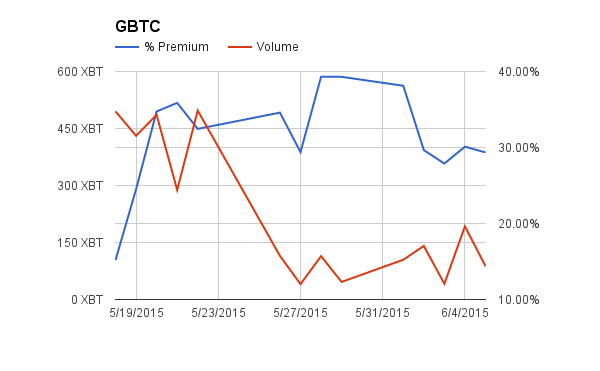 The premium declined 5% points to 31%. 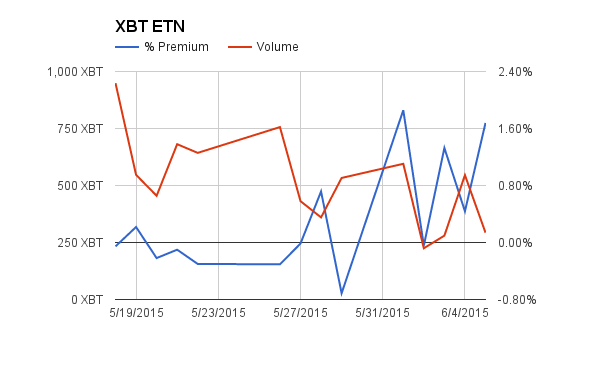 XBT’s average volume for the week was 338 XBT down 25% WoW. The premium rose 1.3% points to 1.13%. Volatility rose moderately during the week, but volumes for both products are much lower than during their debut week. The $230-$235 range monotony was ended with a swift fall to the low $220’s. $220 was breached, but quickly regained. Bitlicense was finally announced and the price briefly rallied to $228. The range then reset to $220-$225. 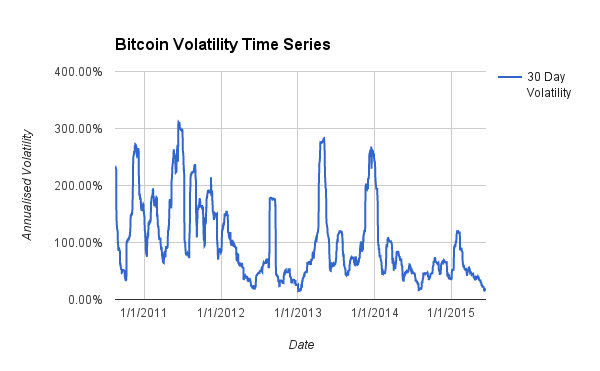 Daily volatility spiked up for a short moment, and traders rejoiced. 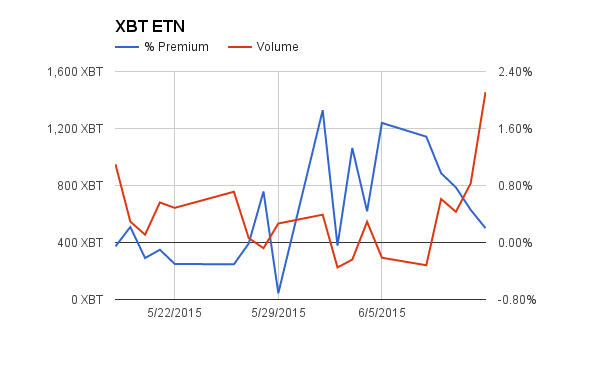 Volatility vanished over the weekend, and this week looks to be another choppy one. The inexorable downtrend to $210 then $200 has not been broken. Each wave of positive news produces a less extreme price rally. It is only a matter of time before the final act, and a concerted push towards $200. 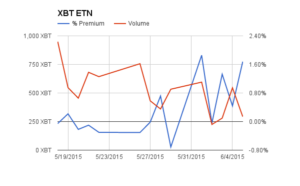 Sell XBTM15 (26 June 2015) between $220-$225. The downside price target is $213, $210, then $200. Be ever vigilant of a short squeeze, and consider covering the position if the price holds above $230.